Book Lost And Found Ads in Indian Newspapers Instantly Online! Why Book Lost And Found Ad in Newspapers? 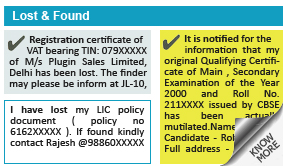 Lost And Found Ads are mainly published for Official purposes by most advertisers across India. These ads are essentially released by individual advertisers as an official notification and documentation of the change in their identity. Newspapers have always been the only choice for any Lost And Found necessary for any official purpose. Text Ads, though simple to compose, should be to-the-point and brief, especially for a Category such as Lost And Found. Display Classified ads, though not common with Lost And Found ads, are still frequently opted for by advertisers. These ads are a type of classified ad which enables you to upload images and logos as per your requirement. Often Lost And Found advertisers intend to put up their own image in their ad matter. Classified Display Ads are ideal for such purposes. 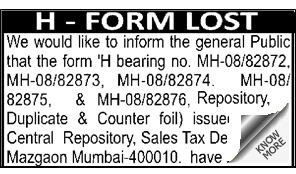 How to Book Lost And Found Advertisement In Newspapers? ReleaseMyAd-the largest online Newspaper Ad Booking Agency of India, has implemented the simplest online ad Booking process. You can now book and release your Lost And Found Classified Text Ad adverts in 3 easy steps online. The first step requires you to visit releaseMyAd.com choose the ad type as Classified Text, which will direct you to the Category selection page, where you need to choose the “Lost And Found” as the category and proceed to select the Newspaper. As you choose the newspaper, you can review the rates and the packages associated with the newspaper and category, based on different editions. The next page, is the Compose Ad page, where you can type in your ad matter and highlight it, if need be, with ticks, bold letters, colour highlights etc. The need for ad highlights is often quite helpful in locating your own Lost And Found advertisement. You can also get a glimpse of your ad before it is printed with the help of the Live Ad Preview Feature, exclusively at releaseMyAd. releaseMyAd has always aimed at simplifying Newspaper Advertising for all our privileged existing and future clients. So to begin the booking of your advertisement, you first need to visit releaseMyAd.com, then you need to choose the ad type as Display Classified and proceed to choose the category as Lost And Found. You can get more answers related to Lost And Found through our Question and Answer Forum. Q. As required for following is the content of the advertisement, which I want to post in English OR Hindi Daily Newspaper of Mumbai "It is notified that my original Qualifying Examination Certificate of Main, Secondary/ Senior secondary Examination of year 1999 (10th), 2001 (12th) and Roll No 4*****4 (10th), 4*****8 (12th) issued by CBSE has been lost. Name of the candidate: V***** S**** G******e Full Address: FLAT NO F/123, NEW SA*****A CHS, NEXT TO PETROL PUMP, SECTOR 12, K*******R, NAVI MUMBAI - 4*****0"
Q. I want to put an ad about the loss of my class 10th mark sheet in any of the leading dailies in Jaipur. Please help and suggest which newspaper advertising agency can help me book the same?